If you do not close the HTML destination, your HTML file might contain no output or incomplete output, or you might experience other unexpected results. The ODS _ALL_ CLOSE statement closes all open destinations. The ODS HTML statement specifies three files and the HTMLBLUE style of output. The BODY= option specifies the file that contains the SAS output. The CONTENTS= option specifies the file that contains the table of contents. The FRAME= option specifies the file that displays both the table of contents and the output. You can open the FRAME= file (ttestf.htm) in your browser to view the table of contents together with the generated output (see Output 20.1.1). By default, the HTML files are generated in your current working directory. You can instead specify a path, such as frame=’html/ttestf.htm’, to store a file in a subdirectory. If you specify the ODS HTML statement with only the BODY= argument, no table of contents is created. The table of contents contains the descriptive label for each output object produced in the PROC TTEST step. You can select any label in the table of contents, and the corresponding output is displayed on the right side of the browser window. The ODS GRAPHICS ON statement enables ODS Graphics, which creates the graph displayed in Output 20.1.1. 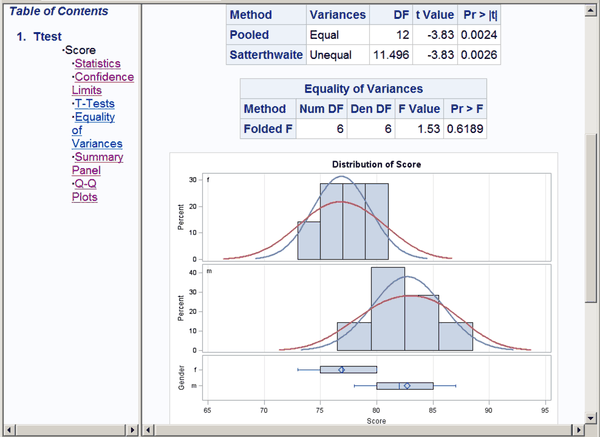 For general information about ODS Graphics, see Chapter 21: Statistical Graphics Using ODS.